The curtain must go up on time! Did we mention this is hard? The good thing is that we’ve done these before and we know how to get things done, plus, we work with a great, experienced team. As much as it is easy to stereotype creative-types as having their heads in the clouds, that can’t be the reality when we have time-critical installations that must get done. Yes, creativity is a critical component of what we do, but to pull this off you also need to blend project management, practical experience, and a high stress tolerance. You must collaborate with many key people beyond your control. You have to problem-solve onsite. You have to wear comfortable shoes – we tracked 22 miles on our Fitbit one day. Another number stat: 12 semi trucks full of furniture needed to arrive on-time (! ), get unloaded, and then have all their contents pieced together and installed. Add into this year’s challenge the fact that this was an international event. But we know how to minimize the risk of something going wrong — great planning yields great results. It’s a lovely, complex piece of logistics and it is incredibly exhilarating when it all comes together! TED is a really big deal. It’s a big deal for those who attend, those who present, those who watch the content remotely, and for all of the teams of people who invest months of effort into an event that comes and goes in five short days. But, for many, the messages, ideas, and interactions that happen there are profound, incredibly moving, and life changing. Amazing ideas come out of those five days, so we all invest very heavily into making it work. All the moving parts need to come together. We must ensure the experience for attendees is remarkable. We want to share a bit about how we get to that day in March, when the curtain goes up. It’s a lot of work and it takes a lot of time to figure it all out. For a project this big the planning for the next TED starts as soon as the previous TED ends. With any space we are working with the first step, before we design a single thing, is the need to understand the space itself. 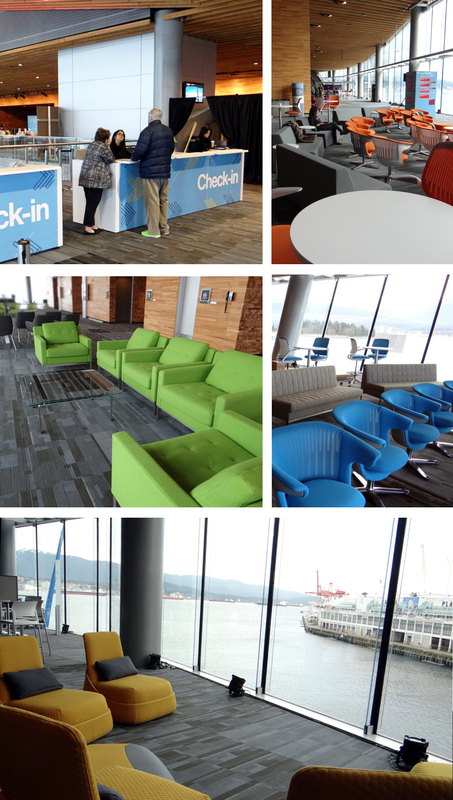 We have numerous site visits where we document the rooms, lobbies, stage areas, hallways, nooks, crannies… We had the advantage of having been in the Vancouver Convention Center last year and being able to improve upon what we accomplished last time. Go back months ago and imagine this long journey’s beginning. As we walk through the space we talk with our partners on what the strategies are for the areas we need to create. Not just around “x number of people” who must have seats, but around what we want people to think, feel, or do, and what the experience for this space must be. Is there an overall theme, an overall impression? We also design for another purpose. We put great value on intentionally enabling people’s interactions that occur throughout the entire TED space. Many attendees rank the connections, conversations, and social interactions, away from the stage talks, as being incredibly rewarding and a compelling reason for being at the actual event. To connect. We create the space to make those happen in a number of ways. After we understand the space, develop the strategy, and account for the interactions that need to happen we dig into our approach. We move to brief building, inspiration gathering, and design exploration stages. Our aesthetic and creative skills get us to solutions that solve for our foundational strategies. We dig deeply into our design experience, product knowledge, and our personal style library to land at work we share to build consensus. 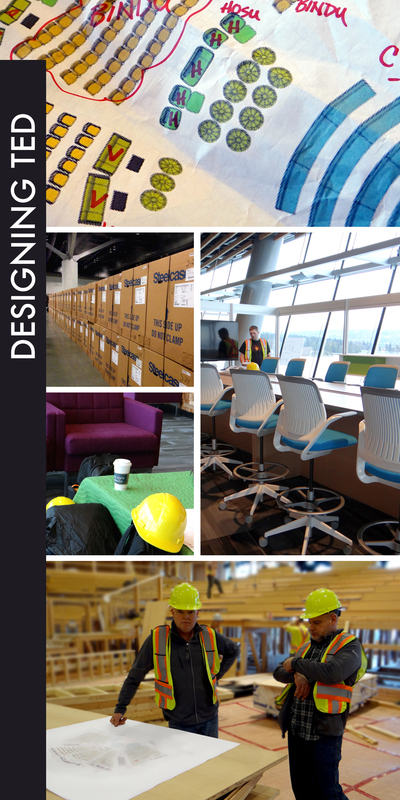 We create plan drawings, mood boards, color palettes, and sparks of inspiration to share with the team. It’s collaborative and iterative and all part of the process. We also need to ensure we are creating solutions that can be executed on time and within budget. Schedule building, approvals, and the business side of communications are all happening along the way. I want to highlight two spaces we created for this year’s TED. The first is the bookstore. Bookstores have been a presence at TED for years, but as we talked this year with the TED team they asked of us: “design some spots for both reading individually and with friends, include a simulcast setting, and make it beautiful”. Cool. We are up for it. I started with the “beautiful” requirement first. Coalesse by Steelcase immediately came to mind. I had access to their warehouse and pulled together a great collection to use that represented a wide range of their well-crafted works of art. It is a stunning product line. For this space we developed a color palette of natural oak, gray, and black, for a setting that artfully combines common and individual spaces pulled together with a warm residential feel (we heard the best comment form a TED attendee: “I want my home to feel like this!”). I’m also sharing the solution for a lounge space on the second floor. We started with what we made last year then built upon it with a ton more color and overall creative freedom, all to give it a high-end quirky boutique feel. And yes – we included a bed where you could recline and watch the simulcast showing on monitors mounted in the ceiling. Up next, the few days before the opening day. All hands on deck! TED31 recently came to a close. This was the second year for TED at the Vancouver Convention Center. If you recall, this was where the amazing stage was unveiled last year. This year it was there again, and it’s still amazing. Not being a new venue, we kept the things that worked well and imagined a few new things for 2015. TCondon was honored to represent Steelcase again and was deeply involved every step of the way. One highlight in the “new” category was a fresh opportunity to develop a new concept and design for the whole first floor experience. That floor is home to a wide variety of solid content that needed to be shared well. And we wanted people to spend time interacting with it, not just zipping through it to get somewhere else. After lots of ideas, we landed on the concept of creating an experience similar to discovering and exploring a cool neighborhood — poking around great shops, restaurants, coffee shops, and galleries. You could interact with a Partner exhibit, take in an art display, sample a food tasting, and drop into a comfy simulcast space. We wanted it to be different from what was typically expected and rewarding for those who spent time in those spaces. The approach worked and we heard that many people really enjoyed meandering through the new first floor neighborhood. We will be posting again soon. Stay tuned for three more updates as we reflect upon TED31!